I bought poblano chiles for the first time on Saturday at the market and wasn't quite sure what to do with them. One look through the trusty Gourmet Cookbook and I found the perfect recipe. The original recipe was for a pasta salad, but I had some kamut (a type of wheat) in the pantry, so I decided to use that instead. 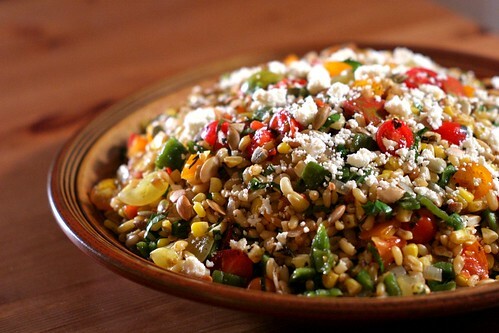 I'm glad I did - this recipe is fantastic as a grain salad. I'm sure wheat berries, farro, barley, or brown rice would work beautifully as well. If you are like me and have several hippie whole grains in your pantry, now is the time to use them! This dish is packed with late summer produce - tomatoes, peppers, and corn. It's a bit of a pain to roast each vegetable separately, but it really doesn't take that long. I had fun roasting the chiles over an open flame on the stovetop - I was a tad nervous that they would catch on fire and fill the air with chile smoke, but I didn't have a problem. I also really enjoyed the dry-roasted onions - I've never cooked onions this way before. I was very very happy with how this dish turned out - it is sooo good! Healthy and colorful and just packed with flavor. Oh, and the leftovers make perfect lunches. As I mentioned in the intro, the original recipe was for a pasta salad, but I used kamut instead of pasta, and it was great. 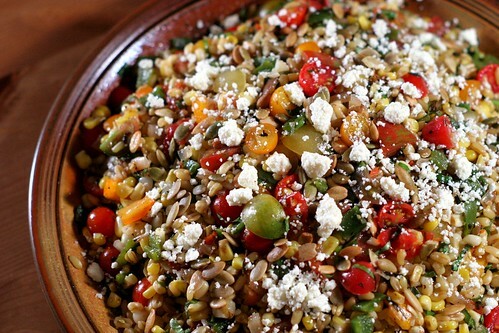 Use any grain that you like here - wheat berries, farro, barley, and brown rice come to mind as good options. I also modified the herbs in the recipe - it calls for cilantro but I didn't have any, so I used basil. Basil is a step away from the Mexican nature of the recipe, but it works well. Use whichever one you like. 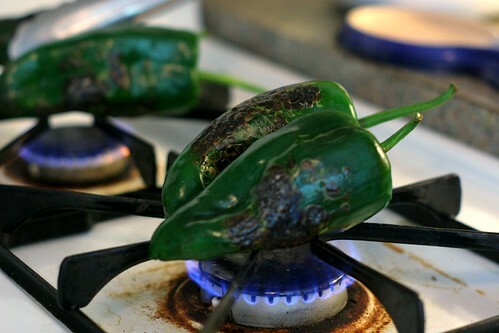 Roast poblano chiles on the grates of gas burners over medium high heat, turning occasionally with tongs, until skins are blackened all over. (Alternatively, you can broil the chiles about 2 inches from the heat source). Transfer chiles to a bowl or tupperware container, cover, and let steam for 10 minutes. When chiles are cool enough to handle, rub off the peels, remove ribs and seeds, and coarsely chop the flesh. Put chopped chiles in a large serving bowl and add the tomatoes, chopped hot chiles, oregano, and basil/cilantro. Heat a dry cast iron skillet over moderate heat. Add half of the corn kernels and cook, stirring frequently, until the corn is browned in spots, about 4-5 minutes. Transfer corn to poblano mixture and repeat with the remaining kernels. Add onion slices to the skillet and dry-roast, turning once, until browned and somewhat softened, but still a bit crisp. Transfer onions to a cutting board and coarsely chop them once they are cool enough to handle. Add onions to the vegetable mixture. Heat oil in the skillet over moderate heat. Add garlic and cumin and cook, stirring, until fragrant, about 30 seconds. Stir into the vegetable mixture. Add the lime juice and cooked grains and season with salt and pepper to taste. Toss salad well. Top salad with roasted pumpkin seeds and cheese. Serve warm or at room temperature. The whole salad looks awesome. I think I may actually make it this weekend! Great seeing you last night and meeting Andrew! Wheatberries and kamut are pretty similar - they're both chewy and kind of have a little pop when you bite into them. I like to stock up on random grains at the bulk bins at Harvest and experiment =). Great seeing you and Adam too! Hope we can get together again sometime. 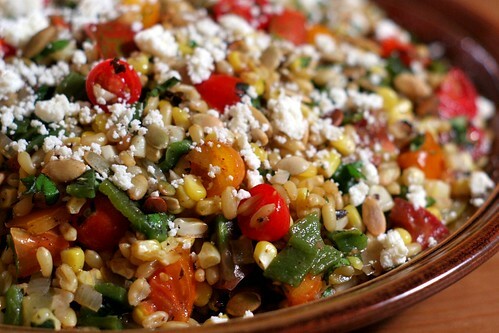 love grain salads, especially with roasted veggies :) fabulous! I love the flavors in the this salad, surely going to give it a try this week. I have some wheat berries waiting to get cooked and I'll have to add kamut to my grocery list now :) Got here from tastespotting and glad I did. Looks delicious, haven't tried poblano chiles before but looks promising. This sounds like a healthy meal. Love your blog. Priya and Tres Delicious - thanks for visiting! Do let me know if you try the recipe.